In my house, Thanksgiving is all about the stuffing.We’re not talking that sad Stove Top cornbread stuff with mushy pieces of lackluster veggies. 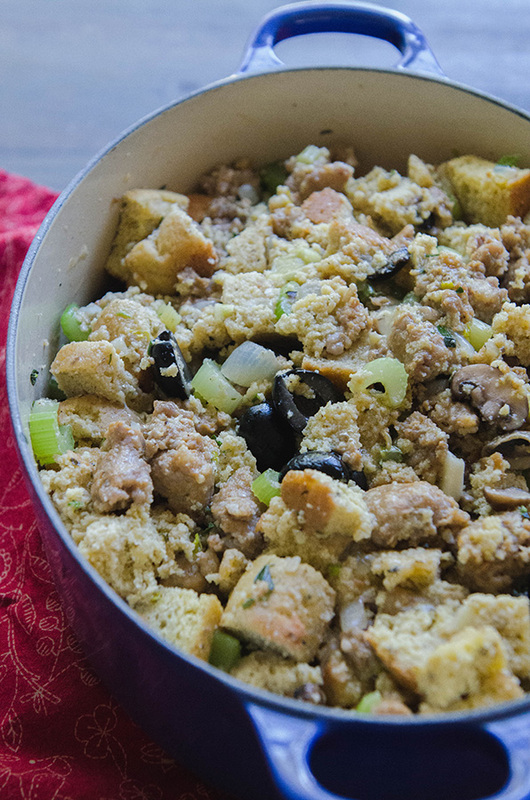 We’re talking my Dad’s famous stuffing– the kind of stuffing that is made with savory hunks of Italian sausage, mushrooms, celery, and flavored with an umami bomb of chicken stock, and the brine-y juices leftover in a can of olives. Oh, and butter. All the butter. Thanksgiving morning always had a rhythm. My dad would have his coffee and then recruit us to do some chopping. It was an event. We took turns slicing celery, and olives and mushrooms. My dad would be over the stove melting enough butter to feel like we were behaving dangerously. Not every day called for this much butter, but on this day in November we would try to push the limits. Things were sauteed together. The smell of sausage and butter and mushrooms provided the world’s most delicious air freshener. He would then pour bag after bag of his Italian spiced bread mix into the pot, and soften it with chicken stock and salty olive juice. The mixture would get perfectly sticky. We’d pour it into Corningware, and lick the spoons before putting them into the sink to be washed. The rest of the day was just a race to dig into this big mound of bread-y goodness. Turkey seemed like a side dish. Gravy, a total necessity. 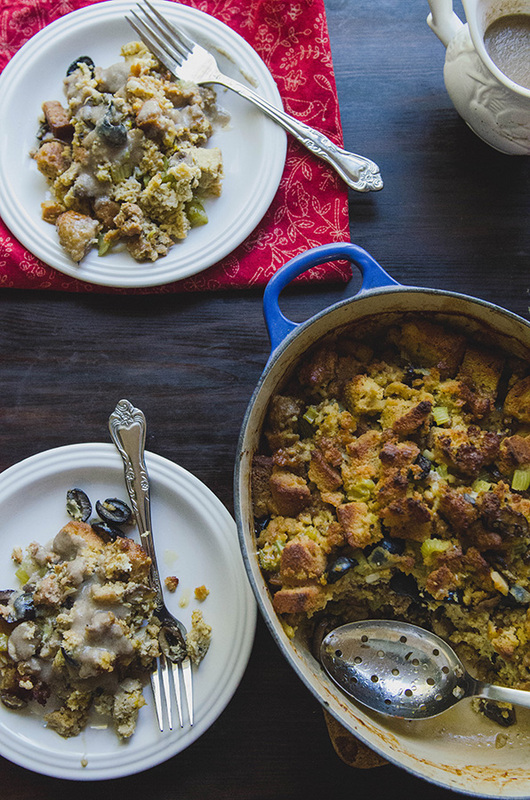 But really, this stuffing was everything. After going gluten-free, you can imagine my complete disappointment as I watched everyone dig into my dad’s coveted stuffing and I just gummed my sweet potatoes. I knew that eating it would make me feel terrible, but I was so completely tempted. Since then, there are have been multiple attempts at recreating this masterpiece while making it gluten-free. The first year my dad and I tried to make it, it was a disaster. We used too much liquid and a sad loaf of gluten-free bread that seemed to weep under the weight of the chicken stock. The whole thing jiggled in a way that is reserved for those green jell-o and pineapple numbers you allow to set in a bunt pan. I ate it. But, ugh. The next year things got a little better, and the year after that better still. By last year it was hard to differentiate between the two stuffings on the table. Huzzah. It was a case of practice makes edible. This year, I decided to go a step further and try to make the whole thing not just gluten-free, but grain-free too. I generally feel better sans-grains, so I thought if I could pull this off I might be able to eat ALL the stuffing without the inevitable feeling of having consumed a cement block. Nobody likes cement belly. I think that’s a life rule. Plus, if I can still fit into my pants after dinner, there is room for a slice of this pie. I have food goals, you guys. I used my friend Beth’s grain-free stuffing bread as a template in my own recipe and ERMAGHERD. This. It is legit, my friends. Since the bread is made out of coconut flour, it provides the absorbency that a gluten-free stuffing has been lacking. Coconut flour is crazy absorbent. If you’ve ever used it to bake, you’ll notice the ratios of flour to eggs seem like a practical joke. Oh, a birthday cake? You just need 1/2 cup of coconut flour and approximately twenty five eggs! Just kidding. Kind of. The best part? I was able to eat a huge hunk of this for dinner and not feel like total garbage afterwards. I might have even eaten it again for breakfast… and maybe again for lunch… let’s just stay I stuffed my face with all the stuffing. Stuff, stuff, stuff. Chomp. Repeat. 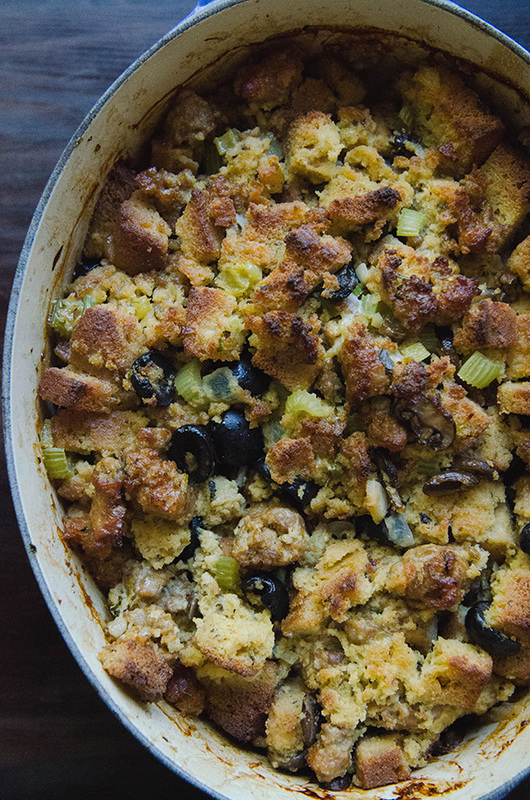 Note: If you’re making this stuffing, make sure you give yourself enough time. The bread has to be made a full day ahead of time in order to dry out and become stale. I like you too much not to warn you. Nobody likes a soggy stuffing mush party. Just say no to Sadsgiving, amiright? Cool. The bread for the stuffing needs to be made a day ahead of time in order for the bread to properly dry out and hold together. Preheat the oven to 350 degrees and line a square brownie pan with a piece of parchment paper. Set aside. Add all of the bread ingredients into a bowl and beat together with a hand mixer until there are no lumps and the batter is smooth. Pour your batter evenly into the parchment lined brownie pan. Use a silicone spatula in order to spread it out evenly to assure an even bake. Bake for 35 minutes, or until the bread is cooked through and browned on top. Allow the bread to cool on a cooling rack for an hour or so before cutting into it. 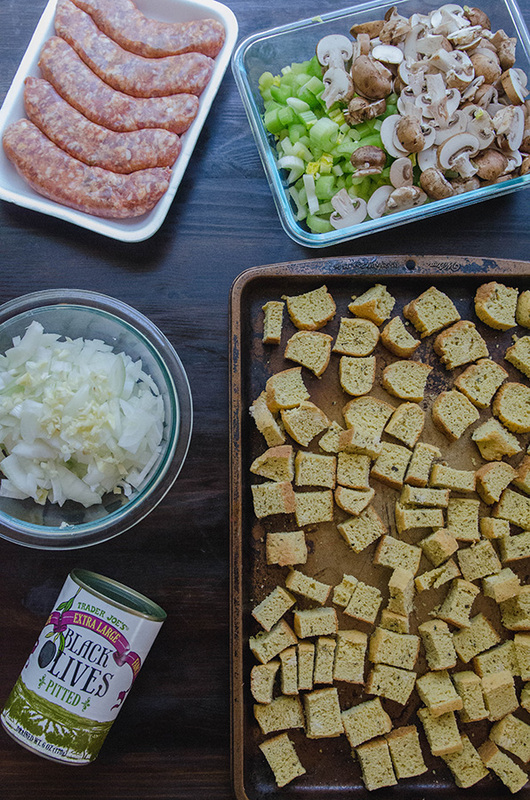 Once cool, use a bread knife to slice it into small crouton sized cubes. Lay these cubes out evenly on a baking sheet and allow them to sit overnight. You want the bread to become stale. The next day, when you're ready to make your stuffing, assess your bread. If it still feels too soft, allow it to toast under the broiler for a couple of minutes in order to firm it up even further. Make sure you keep an eye on it, as you don't want it to burn! Once the bread is stale and toasted, set it aside. Heat up one of the six tablespoons of butter in your dutch oven over medium heat. Once it's hot, add in the diced onion and minced garlic. Allow them to soften and the onion to become translucent. Remove the Italian sausage from it's casing and put it into the pan. Break into smaller pieces and brown the sausage completely through. Once the sausage is browned, add in the chopped celery and mushrooms with the remaining tablespoons of butter. If your sausage seems to have produced a lot of oil, reduce the amount of butter your're using by a tablespoon or two. You can always add in more later, if you feel it is dry. Allow the celery and mushrooms to cook down a bit in the butter before adding the halved black olives. Stir to distribute the olives. Add in the stale cubes of grain-free bread, mix it in to incorporate the sausage and other ingredients throughout. Add in the chicken broth, olive juice, and fresh herbs. Stir until it is well mixed and the bread softens with the juices of the stuffing ingredients. You want it to be soft, but you want the bread to still be in tact and not completely mushy. Once you've reached it's desired consistency, remove it from the heat for a couple of minutes. Whisk a large egg in a measuring cup. Beat it well. Pour the beaten egg over the top of the stuffing and give it one last mix so that the egg is incorporated through out. This will provide some extra binding for your stuffing. 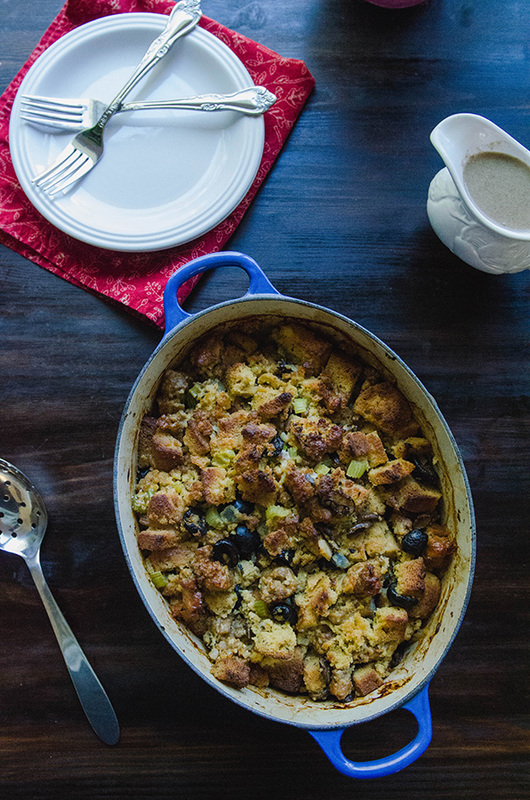 Put a lid on your dutch oven, and bake the stuffing until warmed through, about thirty minutes or so. Remove the lid of the dutch oven and bake the stuffing again for another 15-20 minutes or until the top is nice and crispy. Remove from oven and serve! If you need to reheat it for leftovers, simply put the lid of the dutch oven back on and heat it up again in a 400 degree oven. You want to avoid microwaving, because it will change the consistency of the stuffing. Enjoy! I hate asking about substitutions with paleo baking but do you think ground chia seeds would work out to replace the psyllium husk? I’m with, Em, yes to the sausage!